DryMax Extra Super Absorbent Wound Dressing from HealthyKin.com is a thin, sterile, super absorbent single-use dressing, indicated for use on exuding wounds such as different chronic wounds, legs ulcers, pressure ulcers and diabetic foot ulcers. 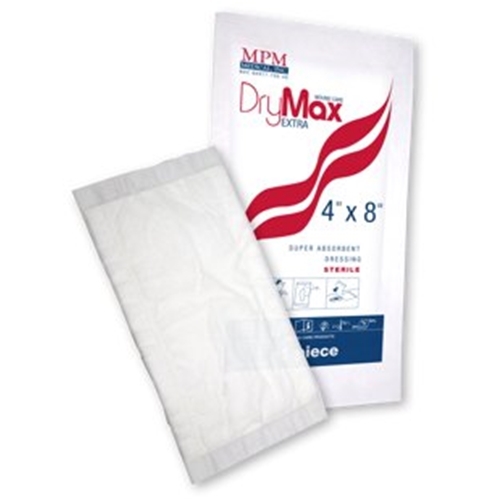 MPM DryMax Extra absorbs wound fluid and retains it in the super absorbent core. The vertical absorption and retention capacity prevents maceration on the wound edges. Bacteria from the wound exudate are absorbed into the core of the product. MPM DryMax Extra can be used under compression and due to its absorption and retention capacity, it reduces the number of dressing changes compared to traditional products. This reduces treatment costs and improves the quality of the life for the patients.